Until you set up your email integration, we send your Bonjoros from [email protected] on your "behalf". Any replies to those messages are re-directed to your correct email, however we cannot guarantee that spam filters will not filter these. When you do set your email integration up...even if you are a Gmail / Microsoft user, if possible still set up Verified domains. This will give you the very best result in terms of deliverability. Depending on your rating, follow their advice to increase your score and ensure maximum delivery for ALL your email. We've just released an automatic re-send feature for un-viewed Bonjoros. Head here to get it set up - and there's a help doc here. 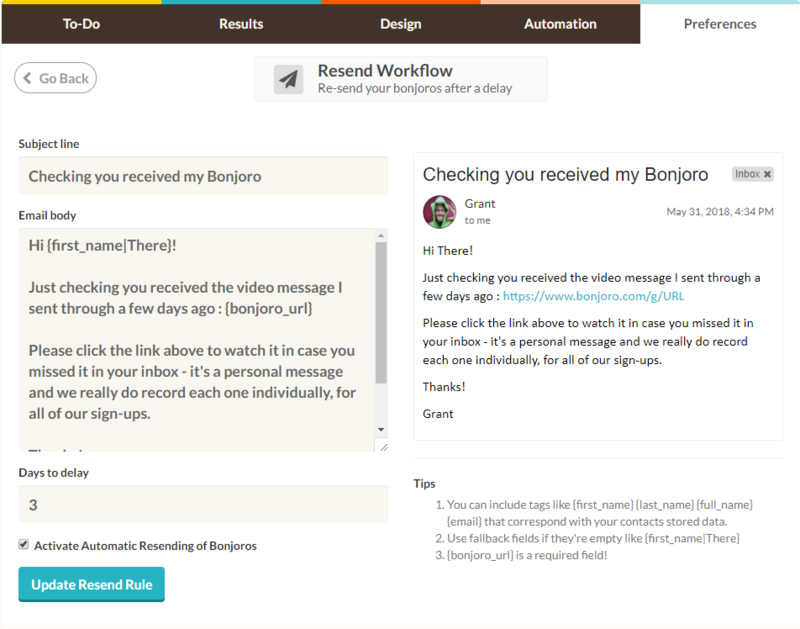 You can also manually resend any of your Bonjoros, head to your results tab, hover over a bonjoro, click 'resend and it'll open your email client enabling you to send your Bonjoro in a plain text email. Some of your Bonjoros may simply being looked over. Make sure you include fun thumbnails, try the "Zuza Wave" and personalise the little message (that shows in your email). More tips in our academy here. Though our own experience shows that we get a better reply rate to cold Bonjoros than cold emails....its still not great, and we generally disagree with cold outreach anyway. Bonjoros are really meant as at least a 2nd touchpoint - make sure people know who you are before you send them.....or it can just be a bit weird! 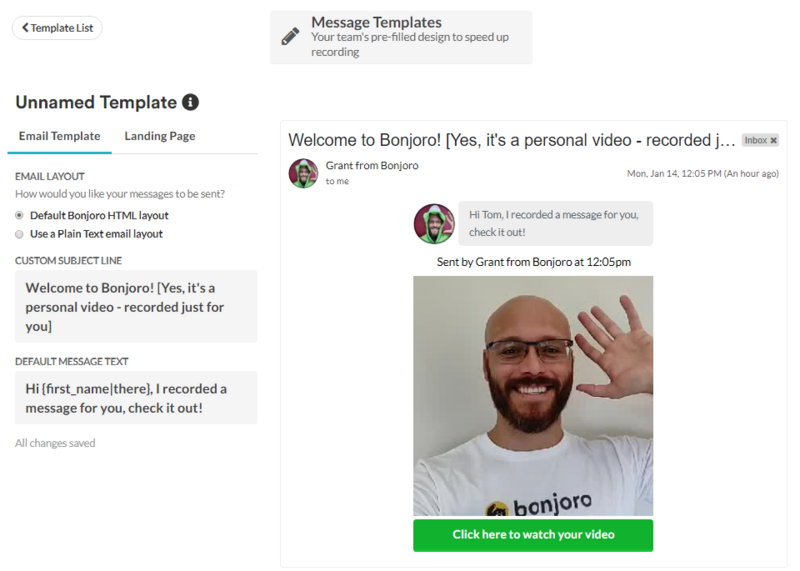 Talk to the team if you are considering where to use Bonjoro in your customer journey and want to bounce some ideas around. Once you have your integrations set-up the quicker you send Bonjoros when someone signs up...the higher the response rate. If you wait a long time opens will drop off as any with email. We've crunched the numbers and the fist 4 hours after a customer performs the trigger action is the sweet spot - with an open rate 5-10% above average. We also saw a steep drop off for Bonjoros sent past the 72 hour mark. Customise the subject line of your delivery email to boost open rates. See here for how to do it and consider testing subject lines in relatively large batches of 40-50 bonjoros a piece to test their impact. You can send your Bonjoros in a plain text email, rather than our HTML template. We've found that the results vary with audience type so we recommend testing with at least 50-100 Bonjoros in both formats to check the impact in your context. To enable plain text emails head to: Settings > message templates. You can set all messages sent in a given template as HTML or plain text. You can set up identical templates and set one as plain and the other HTML to A/B test.